Oxygen-derived free radicals generated during inflammatory responses contribute to tissue injury by a number of mechanisms including the initiation of lipid peroxidation. This process may directly cause cellular damage or generate toxic intermediates that alter cell function. Rheumatoid arthritis is a chronic inflammatory disease in which the presence and action of free radicals can be examined by studying the contents of the synovial fluid. In rheumatoid synovial fluid there is evidence of lipid peroxidation as indicated by the finding that low-density lipoproteins (LDL) isolated from the fluid contain elevated levels of thiobarbituric acid-reactive substances. Both the mechanism of lipid peroxidation of LDL and the possibility that the altered LDL might contribute to tissue damage were investigated. 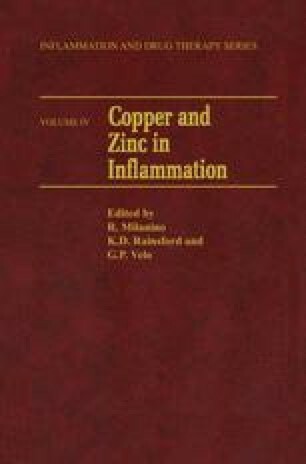 Similar lipid peroxidation of LDL occurred when plasma LDL was incubated with micromolar concentrations of iron or copper. Peroxidation of LDL was diminished by superoxide dismutase, indicating that the process involved the action of the superoxide anion. The possibility that the altered LDL inhibited cellular function was examined by studying its effect on mitogen-induced lymphocyte proliferation. Marked inhibition of lymphocyte function was noted, that could be correlated with the concentration of thiobarbituric acid-reactive substances in the LDL preparation. The inhibitory effect of the altered LDL was not prevented by superoxide dismutase. The possibility that immunological reactivity might contribute to the peroxidation of LDL was also examined. In these studies a marked increase in copper-dependent superoxide-medi-ated lipid peroxidation was noted when LDL was incubated with mitogen-activated lymphocytes. This finding suggested that lipid peroxidation of synovial fluid LDL may be greatly facilitated by the action of the local immunological activity in the joint space. The results suggest that lipoproteins may have a complex modulatory influence on inflammation. Low levels of LDL may undergo peroxidation, but not to a sufficient degree to become inhibitory of cell function. In this manner LDL may protect other tissues by serving as a terminal ‘sink’for free radical reactivity. With more intense inflammation lipid peroxidation of LDL proceeds, causing the altered lipoproteins to become inhibitory of cellular function.